Vessel & Columns – Petersen Inc. 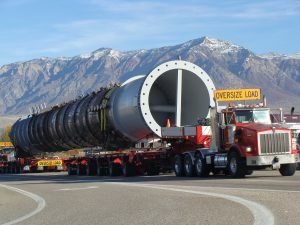 The largest vessel of this contract is the Atmospheric Column (shown here). It is the first (and most important) step in the separation process. Raw crude oil enters a large nozzle and goes through the separation process at different levels of the column (out one nozzle is tar, out another nozzle is diesel fuel, then jet fuel, then the different grades of gasoline, and last is propane. This vessel includes 60 nozzles and 5-manways. This column is clad inside with 317L stainless and is loaded with 73 trays on the inside and insulation on the outside.